Over Labor Day weekend a lot of college students go home or stay on campus to get some work done in advance. My Labor Day weekend was a little bit more active than that as I got to travel to New York City to see a show I had been dreaming of seeing for a long time! On March 1st the new, fully immersive production of Sweeney Todd opened at The Barrow Street Theatre, which was fully converted into a pie shop, after a successful run in London. Soon after it was announced that the actors playing the roles of Sweeney Todd and Mrs. Lovett would be leaving the show in April and would be replaced by Norm Lewis and Carolee Carmello (my idol and all time favorite actress). When I found out that this was happening I was so upset because classes didn’t end until May and right after that I was entering into a 3-month contract with a professional theatre that I was really excited about therefore there was no way to make it to the show before they were set to leave in August. 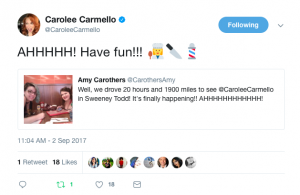 But then, in June, it was announced that Ms. Carmello would be remaining in the show until, at least, the end of September and I decided that I was going to look into ways to get there as a crazy dream. I had some good money from my theatre job and was looking into trains, airfare, anything I could to maybe make this happen. I then said to a friend of mine “tell me this is crazy, there is no way I can do this right?” Instead of giving me the answer I was looking for she said “Why not? Let’s make this happen. The next three days we planned our “spontaneous” trip and approached another friend about coming with us. We bought the tickets and the waiting game began. Every so often someone would comment on the fact that we were really doing this and we would all get really excited. As the three of us were theatre majors and all want to live in NYC anyway we were so excited to visit our future home and see a show that was so creative. Then the day finally came. We loaded up into the car on a Thursday and started on the 20ish hour drive to New Jersey. We stopped on Thursday night in Illinois and slept over in New Jersey on Friday. We ended up crossing 7 states to get there a couple that we had never been in before. On Saturday we took a train into the city and the fun began! As theatre nerd tourists we went to Times Square and saw all the marquees of shows we love, take pictures, and spend way to much money. We then walked the 40ish blocks down to the theatre that was in Greenwich Village right near Stonewall which was really cool to see. When we entered the space we knew that this show was going to be special. We were sat at a table and a crew member came by to tell us to keep our stuff off the table because the actors would be using them as playing spaces and to put our phones away because the actors were so close they would be distracted by us on the phones. As soon as the show began I was mesmerized. It was a once in a lifetime experience being so close to great actors doing what I want to be doing. My idol was about a five feet away from me at her furthest distance away. My friend had also tweeted out to Ms. Carmello that we had driven so far, she replied, and then located us in the theater at a point where she could give us a wave. Throughout the show she played to us making eye contact and even, at one point when she was on our table looking down directly at us, giving us a little wink. A grand tradition in the theatre is waiting at the stage door to try to get some signatures from cast members as they leave. Because we saw a matinee we didn’t know how well this would work but we waited in the lobby to see who we could talk to. We ended up seeing all but two cast members. With the first two actors we talked about our trip and sometimes even their character motivations. After we finished with the second actor I felt the urge to turn away from where the other actors were coming from to look back at the door we took into the actual theatre space from the lobby. Exactly as I did that, my IDOL, the fantastic Carolee Carmello, stuck her head out of the door. I almost died. She started talking to one person outside of that door and when she finished with them came up to my group and said “20 hours right! I saw your tweet!” and I lost it. 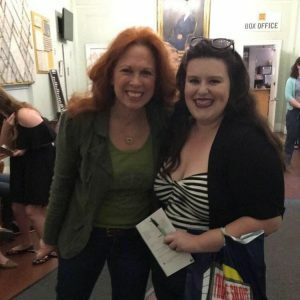 I have dreamed of meeting Carolee Carmello since I was 12 years old and heard the OBC cast album for The Addams Family musical the first time and found out who she was and there I was standing with her in front of me, talking to me, caring about the fact that I came all this way just to see her. She was just as nice as I had hoped she would be. She signed our playbills with personalized messages and let us take pictures with her. I asked her first if I could get a picture and she said “well do we want to do a group selfie” and I said “I would like an individual as well if I could because…well…you’re kind of my idol” to which she laughed a little and said how sweet I was. She asked about our trip and said “You aren’t driving all they way back tonight are you!?! Where are you staying, I hope you are being safe.” She put up with all our shaking and fan-girling. When I went to take my picture with her I was trembling pretty bad and she patted my back and told me I was ok. When she was ready to move on she said “Ok I am going to hug you all now is that all right?” I, of course, said “OK!! !” As she gave us all hugs she said how grateful she was that we made the trip for her and how good that made her feel. Before she left she asked us to keep tweeting her because she loved interacting with people and to tweet her for sure when we got home so she wouldn’t be worried about us. On the way home I made a Facebook post about getting the trip going and my friend Amy said to include that in my “we are home safe” tweet because it was worded so well that Ms. Carmello needed to read it. 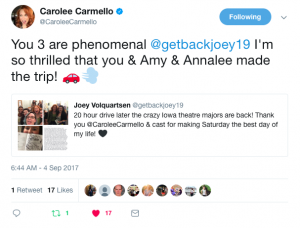 So when we were safe back in the dorms I made a tweet to send out and tag Carolee Carmello in and included our individual pic, our group pic, a pic of my playbill, and a screenshot of the Facebook post. I assumed that would be the end of it but then on Monday morning I awoke to a reply. I have always been told that I never want to meet my idols because they could never live up to the image you created of them. That was not at all the case with this interaction. Carolee Carmello was the most amazing person I have ever met and did not let down my image of her at all. When I got back to my dorm I looked back at the pictures of meeting her and the autographed playbill in my hand and I just began to cry. Happy tears, of course. Just 6 months ago seeing this show at all was never going to happen. 5 months ago, seeing my idol in my dream role was an even crazier dream. Meeting Carolee Carmello has been an outrageous dream since age 12. But just two days ago all these dreams came true. It was the best day of my life.